What is the Welsh Baccalaureate Qualification? The Welsh Baccalaureate is an exciting qualification which adds a valuable new dimension to the subjects and courses already available to 14 – 19 year old students. It combines personal development skills with existing qualifications like A Levels, NVQs and GCSEs to make one wider award that is valued by employers and universities. The Welsh Assembly Government introduced the Welsh Baccalaureate to transform learning for young people in Wales . 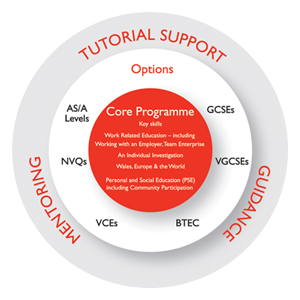 It gives broader experiences than traditional learning programmes, to suit the diverse needs of young people. By adding personal development skills to vocational qualifications or academic study, the Welsh Baccalaureate helps young people to achieve more. It makes them better equipped for the world of work, better informed and more active citizens. It allows for more flexibility in their studies, whatever mix of courses they are following. Students become better prepared for further and higher education, as well as employment. A Welsh Baccalaureate qualification is proof that a student has developed the Key Skills considered important by employers and universities. It also shows that they have furthered their personal and social education, undertaken an individual investigation, gained work experience and actively participated in a community project.